Aeryon SkyRanger is a VTOL small unmanned aircraft system (sUAS). 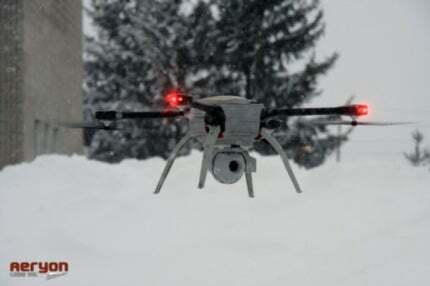 Aeryon SkyRanger can operate in temperatures ranging between -30C and 50C. SkyRanger carries a three-axis stabilised gimbal with dual EO & IR high-resolution cameras. SkyRanger is a man-portable sUAS, which can be deployed within few minutes. Aeryon SkyRanger is a next-generation, small unmanned aircraft system (sUAS) designed and manufactured by Aeryon Labs, a company based in Canada. The sUAS is marketed by Datron World Communications. The vertical take-off and landing (VTOL) sUAS was launched in May 2013. It can be deployed in military and public safety missions, including over-the-hill aerial intelligence, covert intelligence, perimeter and convoy security, search-and-rescue (SAR), chemical, biological, radioactive, nuclear, and explosives (CBRNE) management, anti-piracy, de-mining and natural disaster response. TrellisWare Technologies, along with Datron, Aeryon Labs, and Black Diamond Advanced Technologies presented the Aeryon SkyRanger sUAS integrated with a TSM radio at the US Marine Corps Camp Lejeune in August 2015. The sUAS relayed real-time video streaming and thermal imaging over the TSM mobile ad-hoc network (MANET) during the live demonstration. Aeryon Labs entered a partnership with Protonex Technology Corporation in September 2015, to equip Aeryon SkyRanger with a new in-field battery charging solution. The Protonex power management kits enable the military operators to quickly charge the SkyRanger during demanding and remote missions. SkyRanger is a man portable, quad-rotor sUAS designed for use in harsh environments. It can operate in rough weather conditions with wind gusts up to 90km/h. The VTOL capability allows the launch and recovery without peripheral equipment. The sUAS is ideal for land and maritime applications and its easily replaceable payload, battery, rotors and legs ensure quick deployments. The autonomous operation and intuitive interface further minimise the time and costs involved in the training. The unmanned aircraft system has a diameter of 102cm and height of 24cm when deployed. It measures 50cm-long and 25cm-wide when folded, and has an empty weight of 2.4kg. The SkyRanger integrates dual electro-optical (EO) an infrared (IR) high-resolution cameras in a three-axis stabilised gimbal. The payloads support simultaneous streaming of 1080p video, 15MP still images as well as infrared video and still images. The sUAS also transmits intelligent imagery embedded with metadata/geo-tags, and 256bit advanced encryption standard (AES) streaming video to multiple devices. The UAS can be integrated with custom payloads, including acoustic detection and location, electrochemical and infrared imaging gas and liquid detectors, military field communication systems and radiation detection equipment. The sUAS is controlled by point-and-click touch screen with navigation and camera control interface. The touch screen system allows the execution of dynamic flight plans, including Follow-Me protection and AutoGrid mapping modes. The all-digital network allows the real-time video to be fed to any mobile device with access to operator’s IP network. It supports the operations within the beyond line-of-sight (BLOS) range of 3km, which can be extended up to 5km. The intelligent fault handling system aboard the sUAS detects the potential problems and activates return-home-and-land mode in case of any failure. The SkyRanger is also offered with Aeryon Map Edition, which is a bundled package designed for planning and retrospecting tactical missions that need survey-grade accuracy orthomosaics, digital surface models (DSMs) and point clouds from aerial or oblique imagery. The suite also allows integration with geographical information system (GIS), computer-aided design (CAD) and conventional photogrammetric imagery processing software. The pre-assembled sUAS can be accommodated in a backpack and assembled within a few minutes to become airborne. The folding design offers protection to the payload when stowed in a backpack. The Aeryon SkyRanger offers a maximum flight endurance of 50 minutes when installed with payload. It can fly at a maximum altitude of 15,000ft (4,500m) above mean sea level (MSL). The operational temperature range of the sUAS is between -30C and 50C.